We are finally getting our chilly winter weather in NYC and I don’t mind it one bit, although I do wish there was some snow on the ground. Walks to the river on snowy evenings are one of my very favorite parts of this season and I can’t believe we haven’t taken one yet. I didn’t even mind when last year the river was freezing over and we were taking those walks until March...I am much better suited to bundling up in layers and braving the chill than summertime temps. I have had a quiet start to 2016. It has taken longer than usual to get over my holiday hangover this year, and getting back into the swing of everyday life is taking a little extra effort this year. 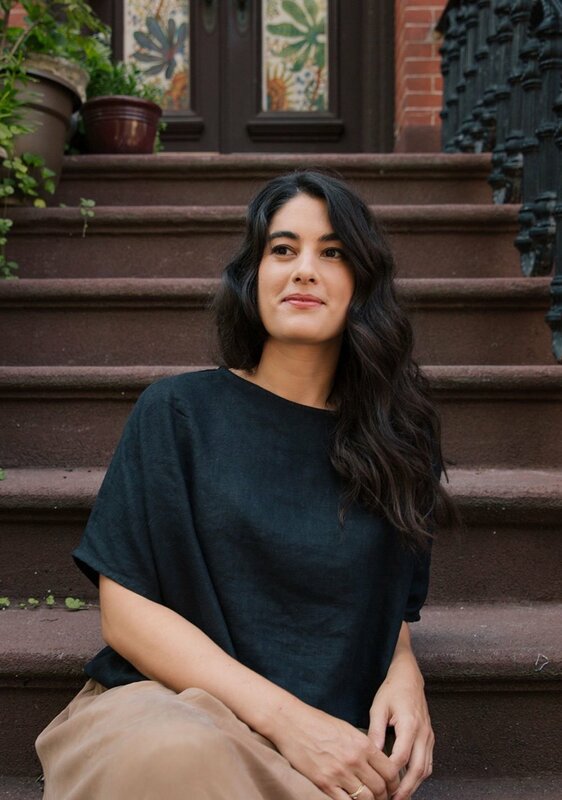 So, I have been taking it easy and spending a lot of time at home, doing the self-care thing and decluttering using the KonMari method. Admittedly, I haven't read the book so I don't know how to fold my socks like Marie Kondo, but the general idea seems simple. It feels really good to get rid of things. Lots of boxes and bags have been sent to Goodwill (how did I acquire so many f-ing photography "props"! ), and I even subjected myself to a round of clothes consigning at Beacon’s Closet. I don’t know what I was thinking. Getting back to my own kitchen and cooking dinner most nights instead of the all too easy take-out option has helped too, but I have to fess up to ordering most of my groceries online for the last couple of weeks - something I am a little embarrassed to tell you all considering I am such a farmer’s market cheerleader (and I know, I know, the packaging is wasteful) - but this is a safe space and I trust that you all won’t judge me too harshly for taking the easy way out for awhile. That online ordering is what brought me the pretty pink lemons pictured in this post, along with cara cara oranges with coral colored interiors, and vibrant blood oranges too. It’s fancy citrus season and there is a grocery delivery company in NYC that always has an amazing selection. My pal Autumn also sent me the loveliest package of meyer lemons, fresh bergamot (! ), and the cutest mandarinquats just before Christmas so my fridge is full of sunny citrus. Have you ever seen a pink lemon? With their stripey green and yellow skin, they are the kind of fruit that is so cute you might think they are fake. Inside, the flesh is the loveliest shade of blush pink and every time I slice one open I hope it tastes just like Country Time Pink Lemonade. The taste is actually pretty similar to a regular ol lemon (maybe a bit less acidic, but nowhere near as sweet and floral as a meyer lemon) but what can I say, I can't resist buying a couple every time I see them. I am a sucker for fancy fruit. I am also a sucker for breakfast pastries, especially ones that are as quick and easy as these scones. I've never made scones without butter before, but these five ingredient numbers are quick and easy to put together and don't suffer one bit from their simplicity. The texture is light and fluffy, more bread than a scone with more fat and it makes them kinda perfect for lots of toppings. You could even omit the sugar, make them savory, and add some cheese and chives. Sounds just about perfect to me. With just five ingredients, these are the easiest scones I’ve ever made. They are less rich, and a bit more bready than scones made with additional butter, but they are still a delicious base for all sorts of toppings from jam and butter to lemon curd. Stir the flour, sugar, baking powder, salt, and lemon zest (if using) together in a bowl to combine. Drizzle in the heavy cream while stirring gently until the mixture just holds together. It should be just barely damp, but not wet. You may not need all of the cream. Turn the dough out on to a lightly floured surface and pat it into a circle about 1-inch thick and 6 inches wide. Cut the circle into 8 wedges and transfer them to the baking sheet. Brush the tops with heavy cream and sprinkle with sugar. Bake the scones until golden brown, 20-25 minutes. Serve warm with lemon curd, butter, and jam. 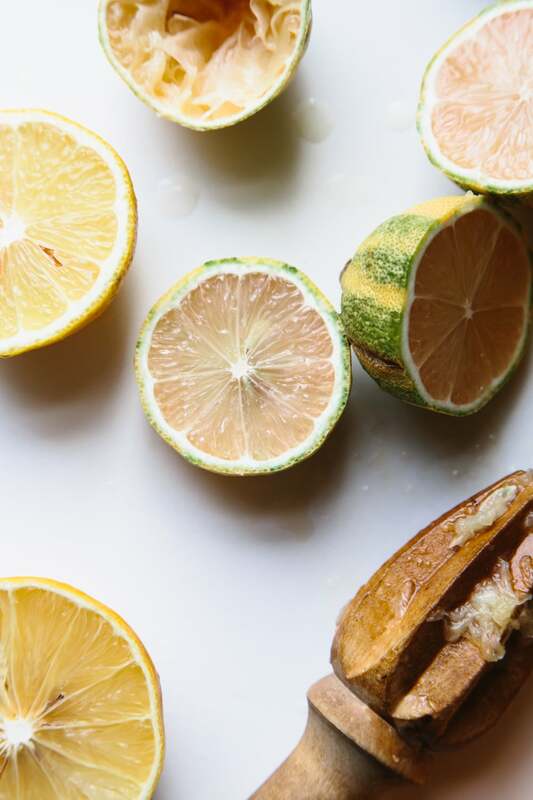 Zest one lemon and one bergamot (or lemon) into a medium bowl and set a strainer over the top. In a medium saucepan warm the lemon juice, bergamot juice, sugar, and butter over medium-low heat until the butter is melted. In the meantime, whisk the eggs and egg yolks together in a measuring cup. Ladle about a cup of the lemon juice mixture into the eggs and whisk to combine. While whisking constantly, pour the mixture back into the pot. Stir constantly with a rubber spatula until the mixture thickens and starts to coat the spatula, 3-5 minutes. Strain curd into the bowl, using the spatula to help the curd pass through. Let the curd cool until just warm then pour it into jars, cover, and refrigerate. A few weeks ago, totally out of the blue, an old friend contacted me with a very exciting proposition. She was planning a quick trip to New York and had magically procured tickets to a taping The Martha Show (!) and was wondering if I was free to join her. It took me about .5 seconds to draft a reply that included many, many yeses, thank yous, and exclamation points. I was more than a little excited to see Martha in person and when we arrived and found out the theme of the show that day was Pies and Tarts, I just about died. Martha's new Pies and Tarts book was about to be released and Martha and her crew spent the whole hour demoing recipes, like coffee cream pie and raspberry rhubarb gallettes, but the best part was when the show generously gave everyone in the audience a copy of the book, along with some other goodies (thanks Martha). On my train ride home, I immediately tore open the book and started dog-earing pages, I dog-eared a lot of pages. 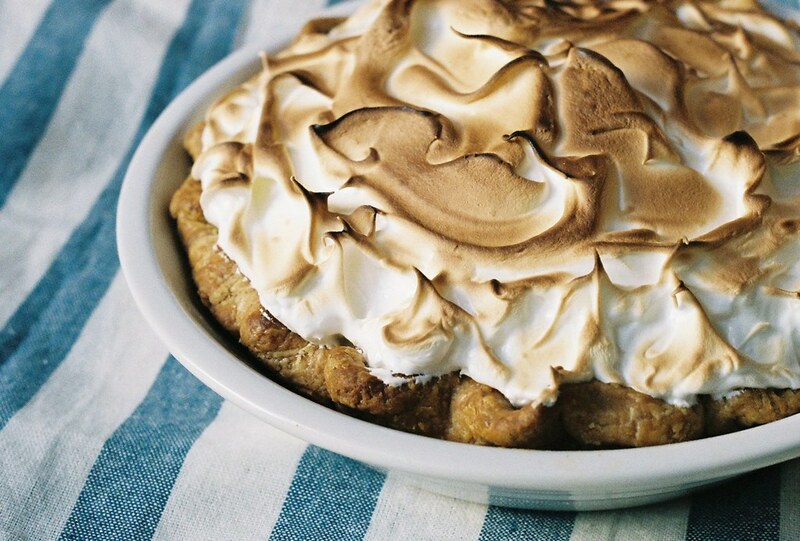 Even though the temps today are in the 30's I am hopeful for a Spring and Summer full of raspberry slab pies and lemon poppy-seed curd tarts of tomato basil pies and panna cotta tartlets, and this lemon meringue beauty that I will definitely be making again. 1. Pulse the flour, salt and sugar in a food processor. 2. Add butter and pulse until the butter is the size of large peas. 4. Dump the contents of the food processor onto a piece of plastic wrap and use the wrap to press the dough together. Separate dough into 2 pieces, form into disks, and chill for at least 30min before rolling. 5. 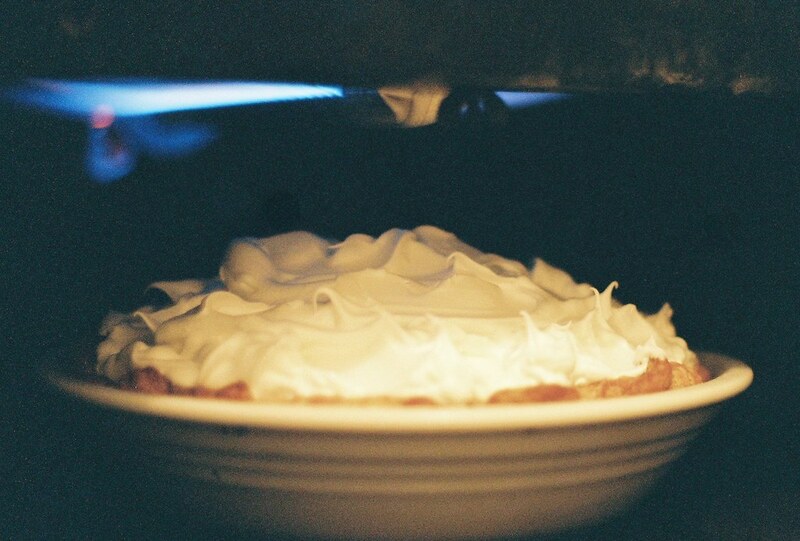 For one pie, remove one dough disk from the fridge and roll out to a 13'' circle. Place the dough in a 9'' pie dish, then fold and crimp the edges to form a decorative rim. Freeze the formed crust for 30min before baking. 6. Preheat the oven to 375 degrees. Line the frozen shell with parchment paper and fill with beans or pie weights. Bake the crust for 15 min, remove the paper and weights, then bake until the crust is golden brown. Set aside to cool completely. 1. In a saucepan, combine cornstarch, sugar, zest and salt. Whisk in the water. Cook over medium hear, stirring constantly, until bubbling and thick. About 7 min (2 min after it comes to a boil). 2. In a medium bowl whisk the egg yolks, then pour the hot cornstarch mixture in a slow steady stream. Return the mixture to the saucepan. Cook over medium heat, stirring constantly until the mixture comes back up to a boil, 1-2 min. 3. Remove from heat and stir in lemon juice, then add butter 1T at a time. Let the custard cool for about 10 min. 4. 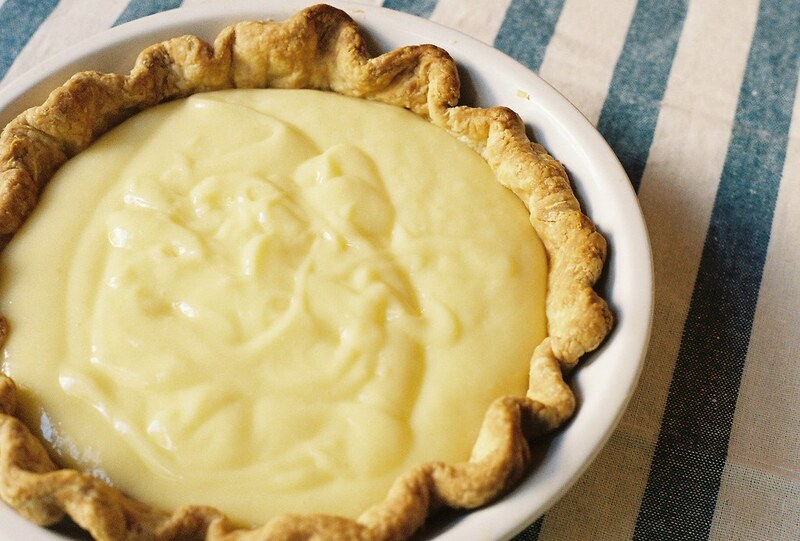 Pour custard into prepared crust and place plastic wrap directly on the surface. 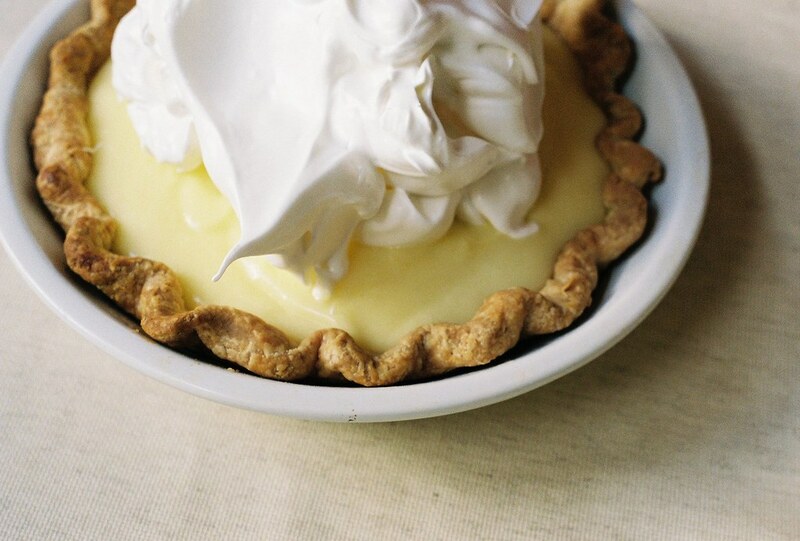 Refrigerate until custard is firm (6 hours or overnight). 5. When you are ready to serve, prepare meringue filling below. 1. With an electric mixer on medium speed, whisk egg whites and cream of tartar until foamy. 2. Gradually add sugar, increase speed to high and whisk until glossy and forms stiff peaks, stir in the vanilla. 3. Spoon meringue onto the surface of the pie until it reaches the crust, then use a spatula to create a swirly, peaked pattern. 4. Gently brown the topping under your broiler, or with one of those fun kitchen torches. Be Careful! It only needs to be under the broiler for about 45 seconds so keep an eye on it the whole time.